As you pack your suitcase you are doing what businesses call a cost benefit analysis. Pack too much and you might have to pay fees or worse yet throw out your back carrying needless weight. Too often people pack things that they can easily purchase at their destination. But here are 7 things that you should take with you that will actually save you money. As long as you remember to turn off data roaming which can cost you lots and lots of money then a smart phone like an iPhone can be one of your best money saving tools. • Skype – You can save money on calls home by using Skype on your smart phone to connect to friends via skype or you can even call phone numbers directly. Any spot with free wi-fi becomes a free (calling another Skype user) or affordable (calling an international number) phone booth. I have a Skype out plan for $3 a month that lets me call any U.S. or Canada phone line for free. While we visited Hong Kong I stood outside a government building with free wi-fi and participated in a conference call to the U.S.
• Wi-fi hot spot – I realized last year that for the cost that one single hotel stay would charge me I could by a data plan for domestic travel for a month so that I could use my iPhone as my wi-fi hotspot. So instead of bad and expensive hotel wi-fi I could bring my own wi-fi, which I could also use in cars, buses, and airports. You have to monitor your data usage so that you don’t go over your plan but for frequent travelers this can be a good option. Since I was doing business travel my company picked up the cost of the added feature on my data plan. This is an even better idea since I have switched to a T-mobile plan which has international data roaming. Some people think that you can’t take a water bottle through airport security. You can, just not the water. I always pack an empty water bottle that I refill on the other side of security. I have just purchased a collapsable water bottle that has very little weight when it is empty and takes up almost no space. You should stay hydrated when you fly, but why buy a bottle of water at airport prices? If you are going to an international city known for it’s pickpockets, then the best money saving product is the one that keeps your money in your pocket and not someone else’s. In a two day trip to Rome with a group of 10 people, 2 of the 10 were pick-pocketed but in both cases they had not taken the precaution of leaving their wallet at home and switching to a money belt or a money pouch that you wear beneath your clothing. This will not only save you money but the stress of being in a foreign country trying to report a theft and trying to replace your credit cards. If I am going to be gone for more than a week I will usually put half a cup of dry laundry detergent in a zip lock bag and throw it in my suitcase. Not only do I not have to try and find an appropriate amount of detergent to do laundry but it will make my suitcase smell better. I also take a stain pen like Tide to Go or a Shout Wipe and Go that I can use to get out stains, because for some reason I get more clumsy on vacation, and a small packet of Wisk or some other soap appropriate for hand washing a few items. I usually just throw in a couple of granola bars, pop-tarts or a zip lock bag of home made trail mix (peanuts, M&Ms, raisins) in my bag before I go on any plane trip. You never know when that connection will be shorter than you thought or the meal service (if there is one) will be delayed. It is always a good idea to have a snack to make your traveling companions happier. If you travel with kids, then double down on snacks. For a road trip extensive snacks and a cooler are appropriate, plus a 12 pack of Diet Coke for me, because why pay $2 for a soda if you can bring one from home for $.25. Are you a member of a auto association like AAA? Are you a senior in AARP? Do you have a student ID? If so, bring along your membership or id card as many destinations have discounts that you can take advantage of. This does not just apply to theme park admissions and other places where discounts are posted but even to some restaurants. My favorite BBQ place will give you a free soda if you show your AAA card. Does your company have any travel discounts? Many large companies have discounts that employees are completely unaware of. Ask your HR department. Are their discounts you may be eligible for because of your profession or professional associations? Many travel experts recommend a portable travel scale as a way to make sure that your bag is not overweight. I own one but do not pack it because my philosophy is that well before your bag gets that heavy, you have packed too much. 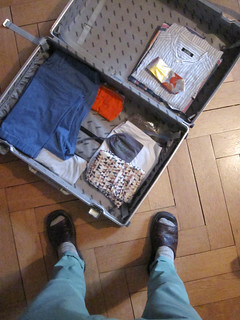 The same goes for compression bags that help you pack more densely in the same size suitcase. Packing lighter can keep you from hurting yourself or someone else with a heavy suitcase. Packing light enough that you can do carry-on luggage will give you options when travel goes wrong. You don’t save money when you take a large suitcase and then your luggage gets lost because of a tight connection. If you get sick for a week, then you can probably buy whatever medicine you will need at your travel destination, because people probably get sick there too. But I still recommend a small medicine kit in your carry-on. I carry a few cold tablets, some ibuprofen (for when I throw out my back because I overpacked), some anti-diarrhea medicine and a sleeping pill I have carried for years because I am afraid to take it a mild sleeping pill which I take when I want to sleep on a long flight. I also have a few band-aids. That way you won’t find yourself buying a whole bottle of something in the airport newsstand because this travel has just given you a headache. My best travel advise is make yourself a packing list so that you don’t have to buy that one thing you had planed to take, knew to take, but is still sitting back on your dresser at home. With a list tested from previous trips I can pack for a month of travel in less than 15 minutes and not be stressed that I am forgetting something. Woah, these are some awesome ideas! Out of curiosity, which Skype plan do you use? Also, what cell phone provider do you find best for long-term travel. I’m going to be in Europe for a 16+ months and I know my Verizon plan won’t allow me to “switch” to an international plan. Andi, I have the Unlimited US & Canada Calling subscription. If you have a Verizon iPhone 5 you can use it unlocked internationally and use a local sim card. @Chris Christensen That’s great to know! @AdventurousAndi yes, that plan just gives me free calling from skype to numbers in the US and Canada. They have similar plans for China and the UK. Great ideas. I also switched to a wifi hotspot a while ago. For a while I used a virgin mobile month to month, found I only used it half the time so I wasn’t always paying that bill. But I switched to using my ATT phone as a hotspot as it was cheaper for more data each month and I always had it on me and charged. I have a luggage scale too, I only take it on a trip where I’m leaving close to weight (like for a cruise). But either way it’s great to know your weight before you leave home, gives you a guide on how much you can buy.